Saturday, December 2nd, we couldn't be more happy to have one our international resident DJ's atish back with us at Do Not Sit On The Furniture for some pre- Art Basel action! 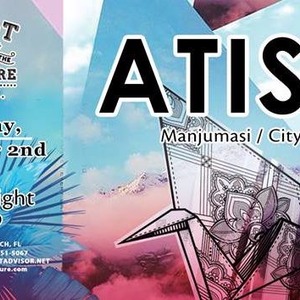 atish [Manjumasi / Cityfox / Listed] > https://soundcloud.com/atish >> https://www.facebook.com/atishmusic Support by: Surreal Flight Viktop > DJ ATISH The Atish experience: dynamic, emotive, ecstatic. Yet it is more than the sounds emanating from the speakers, it is also the man behind the decks: warm, compassionate, inviting. He is an entertainer and a catalyst: a magician who mixes deep melodies and sophisticated rhythms into musical journeys. Based in San Francisco, Atish has cultivated a devoted following around the world. He’s a natural performer who engages crowds with charm, a smile, and possibly a wig and a tutu. An obsessive music collector, Atish pulls from a broad sonic palette, and with these sounds he creates intimate atmospheres and emotional experiences that linger in your mind long after the music has stopped.